* If you are interested in the history of the Huerfano Valley, be sure to read the comment section. Bill and I headed out at 6:00 a.m. for an 8 o'clock rendezvous with Bill's daughter, Laura, grandson, Quinton and friend, Nathan in Walsenburg, Colorado - gateway to the Huerfano (pronounced War-fan-oh) Valley. 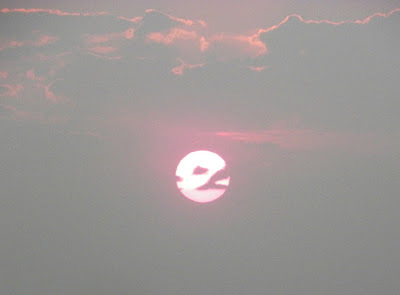 The sun was bright red as it came up over the horizon and broke through the clouds and the lingering smoke from the Los Angeles fires. "Red sky in the morning, Sailors take warning..."
After a huge breakfast at George's Restaurant (they have the BEST breakfast burrito with green chili! 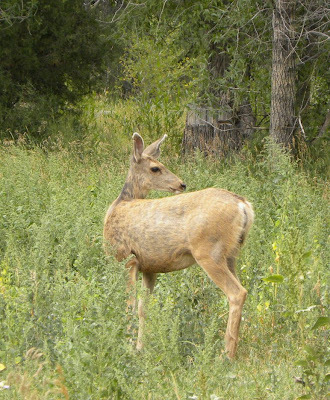 ), we drove west along Route 69 towards Gardner, CO - a small historic town that was over-run with hippies in the 60's - turned onto CR550 to Red Wing - more of a bend in the road than an actual town - and through the Huerfano State Wildlife Area to the Upper Huerfano trail heads at the foot of Mt. Blanca in the San Isabel National Forest. Most of the trip was slow and extremely bumpy as we crawled over rocks and boulders on the poorly maintained jeep trails - but the views were worth it! 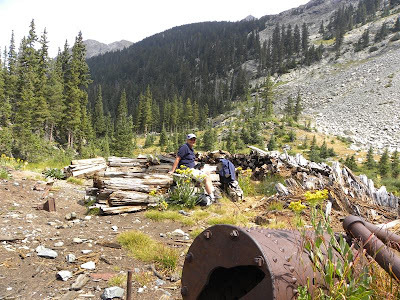 This cute little fixer-upper was along the trail at exactly 10,000 feet. I would love to know the history - who, when, how and why. Finally, a little after 10:00 a.m. we headed out on the trail. The youngsters, Laura, Quinton and Nathan were already way ahead of us old folks. They took a detour up to Lily Lake on Blanca Peak as we headed further west to the high mountain canyon on the back side of Mount Blanca. The elevation at the trail head was about 10,600 feet, over 4000 feet above Colorado Springs. 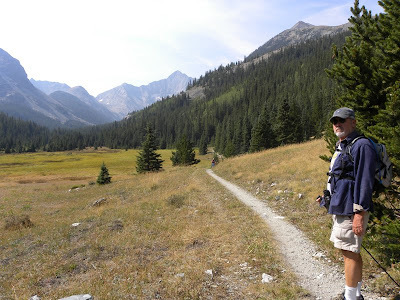 Hiking was much more of a challenge for me at that elevation - so we took it easy. 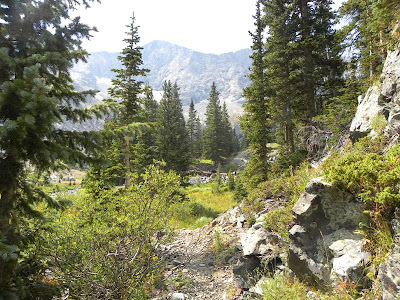 The trail wound up and through some of the most beautiful scenery in Colorado, roughly following the Huerfano River back to its headwaters. 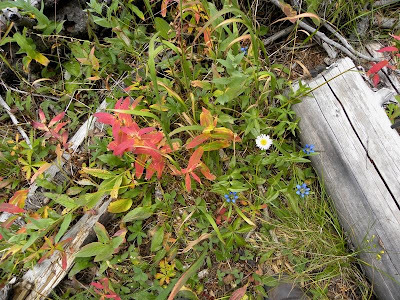 The flora was colorful but most of the wildflowers were past unlike last year when we hiked there in early summer. 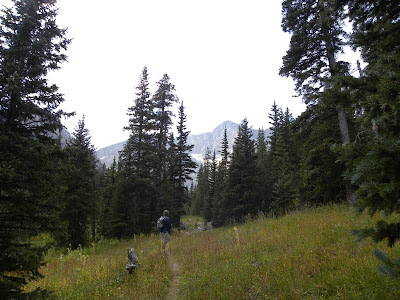 We could see Mount Blanca and Mount Lindsey through the trees. 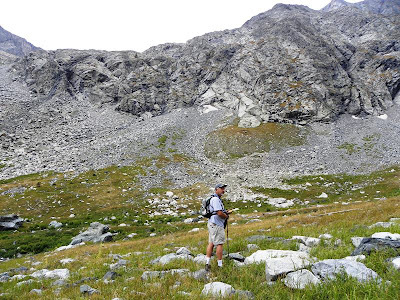 There were pockets of snow on the barren rocks above treeline. This time of year, most of the mountain snows have already melted so it was a dryer walk than earlier in the year. We crossed the stream almost a dozen times and still kept our feet dry. That's because, this trip, we remembered to pack dry socks. 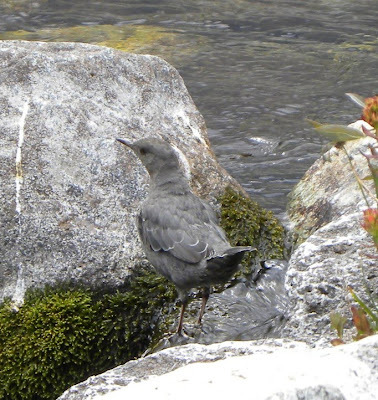 This is an American Dipper, a strange little non-descript stout, dark gray bird that lives along the river banks. He feeds on aquatic larvae by jumping head first into rushing water. 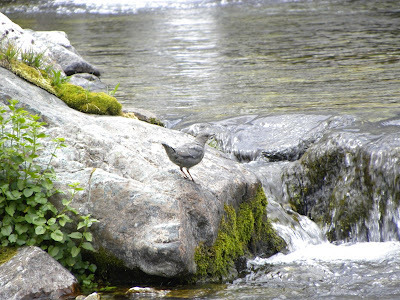 We stopped and watched this little guy as jumped from rock to rock before diving into the cold water for a light snack. What a hoot! Further up the trail we could hear voices. Looking out of the woods towards the river we saw a group of horseback riders with pack mules walking single file back along the lower trail. Two of them came over to talk to us. They were Rangers with the U.S. Fish and Wildlife Service. They had just ridden up to stock Lily Lake with fish and were on their way back to the trail head. They told us to be careful as it was archery season and there there hunters in the area; not to mention the bear and mountain lion. 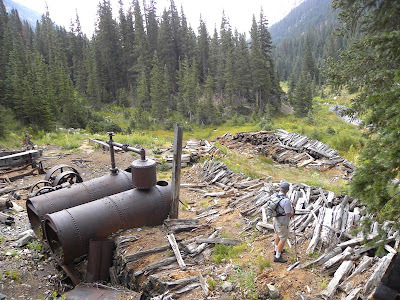 We were almost to the McMillian Mill, an old, long-ago abandoned, mill site set deep in the canyon. I don't know much of the history of the mill site, except it was built to support the MacMillan Gold Mine higher in the mountains. The mine was once owned by Bill's father-in-law, Jay Parsons and his friend, Harold Brown. 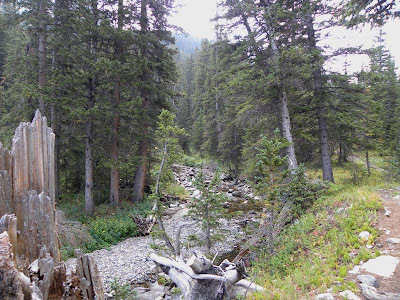 As far as we know, it was sold after the Forest Service blocked motorized access (they blew-up the road) and made it a wilderness area. "The MacMillan Mine mined gold and some silver. It was a hard rock mine at the foot of Mt. Blanca. There were 2-3 boarding houses and many family residences. They were snowbound November through April or May. They had a six or eight horse team they used to freight ore out and bring supplies in. They were all white horses, and they were rigged up with sleigh bells all over them because they hauled that wagon in and out fast and wanted everyone on the road to get out of their way. Alton's mom remembers two or three saloons up there. They were still standing when I was a kid. The MacMillan Mine operated years before I was born in 1906." 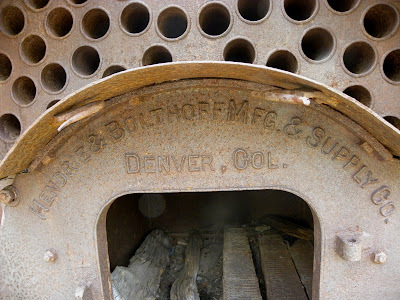 All along the trail, we crossed thick cable lines and timbers that were laid to support the wagon trains that brought in the workers and heavy equipment and carried out the the gold and silver ore.
Hendrie & Bolthoff Mfg. and Supply Co, Denver, Col. 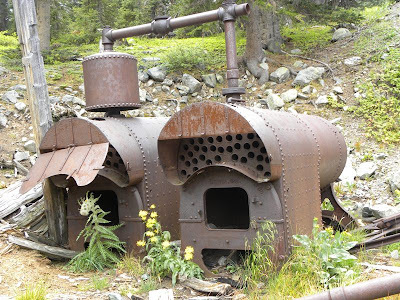 These are the steam boilers that powered the crushers and ran the tram that brought the ore down from the mines. We stopped at the mill site for a light lunch. It was obvious that many, many people had been there before us. Behind me is a decaying wood pile with enough firewood to keep a fire going through a long, cold winter. Above the mill, almost to timberline, in the heart of the canyon. There were high walls of mountains on three sides. You can see the snow on the mountain. There were several thick wrapped steel cables coming down the side of the mountain from the abandoned mines. 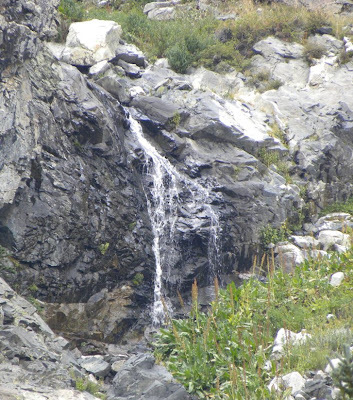 This is one of the waterfalls that marks the headwaters of the Huerfano River. This time of year, it's just a trickle - but that's not the case in the Spring when the snow begins to melt. 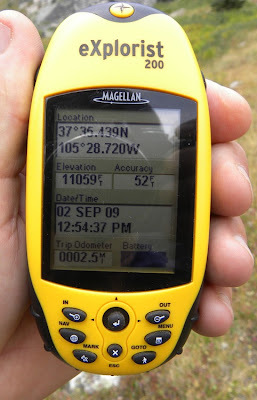 Our GPS was useless as the mountain walls blocked the signals from the satellites. 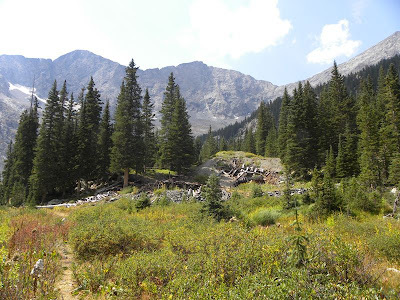 It stopped at 11,059 feet - back by the mill site. We explored the area and took lots of pictures before the clouds began to darken and we heard thunder in the distance. We decided it was time to start the long hike back to the car. The "kids" caught up with us about the half-way point. 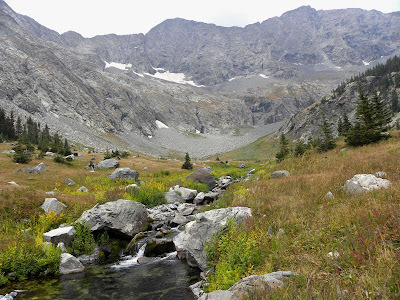 They had reached Lily Lake (12,400 feet elevation) and come down around the mountain, through the pass to the canyon where we had been earlier. They went on ahead waiting in the car where it was warm and dry - while we battled rain, sleet, hail and snow the last mile of our trek. It was a wonderful hike and we enjoyed every minute! On the way back we detoured to see some more of the area. 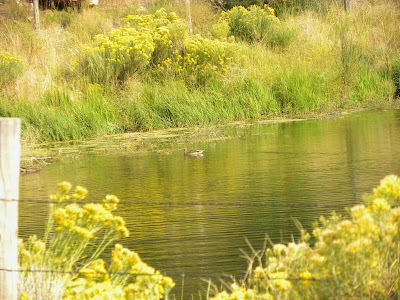 This picturesque duck pond was near Gardner. 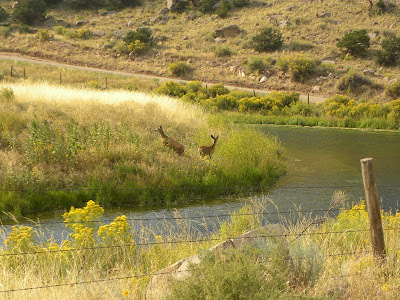 There were two deer on the other side of the pond. And even more deer down the road. 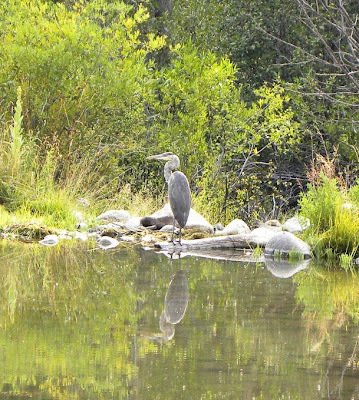 Every time I see a Great Blue Heron here in Colorado, I wonder when he will head back to Florida. All-in-all, we saw dozens of deer, chipmunks and black mountain squirrels; several marmots, and lots and lots of birds. We didn't see any elk, bear, mountain lions or hippies. The Garcia brothers and their wives, hired hands and children appear in the 1870 and 1880 censuses, as well as in the tax rolls, land ownership records and water rights records. The oldest brother, Pedro Antonio Garcia, with a large family and larger land holdings, may have been the locally recognized leader or patron of the community. In addition to paying attention to American property law matters and water rights, he may also have promoted communal activity, encouraging or planning the construction of the fortification that became known as Fort Talpa. In addition to the monumental task of making all of the adobe bricks for this very large building, this construction project required the cutting, shaping and transportation of dozens of medium-sized to huge trees from the high elevation forested areas. Perhaps the settlers were able to float them down Turkey Creek or the Huerfano River to the Talpa site. However it was accomplished, it required a large, skilled workforce. The fact that the original building is in relatively fair condition after nearly 150 years is a testament to the knowledge and organizational ability of one or more significant community leaders. HUERFANO — If there were one settlement in Huerfano County more remote and less remembered than Seguro, it would be McMillan. 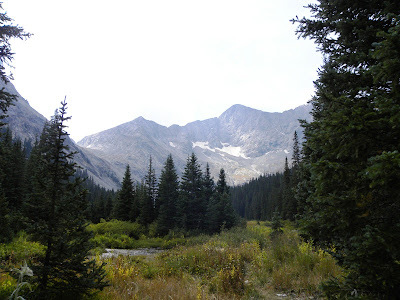 The little burg was at the headwaters of the Huerfano River below the towering summits of Blanca and California peaks. 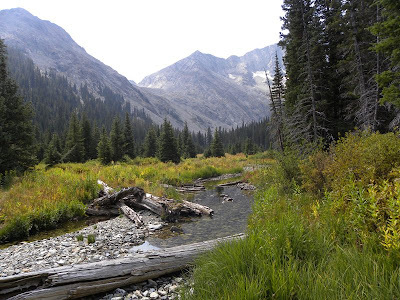 McMillan was home to hardy and, face it, greedy gold prospectors. The climate and location were less than ideal, since the community was at approximately 11,000 feet. Nevertheless, it had an exciting though short lived existence. Most of the gold claims around the community had been filed in the 1890s, though a few were earlier and few later. The existence of gold on the Sierra Blanca had been proven time and again, from early Spanish explorers through the centuries. The south face of the Sierra Blanca had several gold communities, as did the west side in the San Luis Valley, so it only seemed natural that the north face should also be blessed with rich ore. 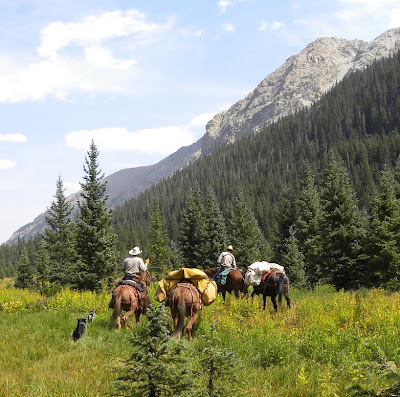 The prospectors of the 1890s gave the valley their respect, probably having learned the hard way of the rigors of winter at that altitude and distance from other settlements, so did their laboring during the summer months. During the snowy season, they retreated to the more temperate community of Seguro at about 9,000 feet, or farther to the east. As the crow flies, Seguro was six miles below McMillan, but as the horse plods, and the terrain permits, the trail was longer and basically followed the river. In January 1893 a vein of silver so excited some of the miners that work continued in the snow, and it was believed a camp would be established near the mine before spring. It wasn’t. The big problem with the location was the lack of a road. The area could be reached only by foot or horse. This proved to be an insurmountable problem in hauling provisions and building materials in, and ore out. A petition reached the county commissioners in 1895 to build a road, but it took several years before the grade was completed, and that was only because the mine owners themselves hired building crews. Development of the mines exploded when the road was opened, and huge pieces of equipment were hauled in for the stamp mill, tramway, mines and electric plant. Yes, they had electricity way up there. As the nearest real town, Gardner experienced a bit of a boom itself. The shortage of wood at the high altitude of the mines meant ties, props and even firewood had to be hauled in. Edibles of every type, except potatoes, were brought in, including sides of beef. In 1898 one Willet McMillan appeared on the scene and liked the prospects of what was then called the “Sierra Blanco.” He maintained a home in Crestones (Chama) while he purchased and developed a number of small mines that he operated under the name of the Coronado group. By this time a daily stage had been inaugurated between Walsenburg and Gardner. August Unfug owned it, and the stage carried the mail as well as six passengers. From Gardner, one either had to walk the 27 miles to the mining camp, or hire a horse from the livery. Several months after the stage line was established, another was started from Gardner on up the Huerfano River. It ran three times a week, and also carried the mail up to the Seguro post office. In 1899 McMillan had found ore assaying in the thousands of dollars, though, being near the top of the Sierra Blanca, was very hard to reach. Though it is now officially set at 14,345 feet, Blanca Peak at the time was thought to be the highest mountain in Colorado. Still, McMillan built a large boardinghouse, the tramway, several cabins and other buildings. A sawmill was built a ways down the valley, in the pines. On July 20, the little camp was “surprised” by a snowstorm. Rumors were flying that summer that the Denver and Rio Grande Railroad would extend its lines either from Westcliffe or Walsenburg to reach the mines. Just before the New Year of 1900, word reached Walsenburg of two miners arguing over a claim, then shooting and killing each other. The very location and remoteness of these mines would spell their doom, because the area had never been properly surveyed, so exact claims were hard to prove. 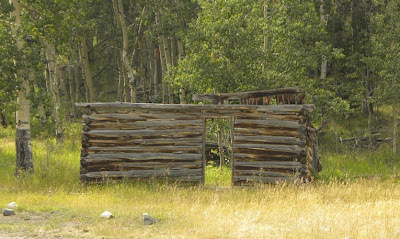 County Surveyor A.A. Foote laid out a town site on the old Peter Bucher home ranch in early 1900, and the miners chose the name of Source for it, because it was at the source of the Huerfano. This puts the site at or near what is known as Lily Lake, another of Huerfano’s ghosts that came down in history misspelled. The lake was actually on the property of Cephus Lilly, who owned the Lakeview Mine. The Coronado mines were employing from 17 to 25 men, and the monthly payroll exceeded $1,500. When a post office was established in September, it was named McMillan, not Source. This post office was said to be the second highest in the state. A store was opened, and plans were made to add a saloon and livery stable. By the end of 1901, McMillan and company had a payroll of about $3,000 per month. He began construction of a concentrating mill. By the time it was finished the next year, it had cost $100,000. The tramway had come down in a winter storm, and the new one he built was 4,000 feet long. The concentrating plant lightened the ore considerably, meaning it was easier to haul out of the valley. After a six-horse team had fallen off the road earlier, this must have been a relief to man and beast alike. 1902 brought two disasters. A grass fire of 1,000 acres destroyed three cabins, and an early (or late) snowstorm ruined the 4th of July festivities. That winter was harsh, with 20 feet of snow covering the site completely, even the stovepipes of the cabins and boardinghouse. Not even Mr. McMillan could reach his mines. 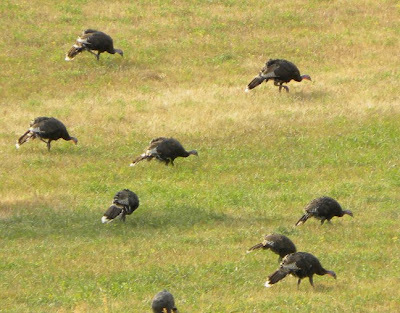 When the snows receded, few miners returned. 1903 saw but a few stalwart miners at work, and in 1904 McMillan left the mines and headed down valley as was his habit, but this time he never returned. He was in litigation with other companies over locations and claims, and now his disgruntled, and unemployed, miners began suing for back wages. The McMillan post office closed Sept. 15, 1904.